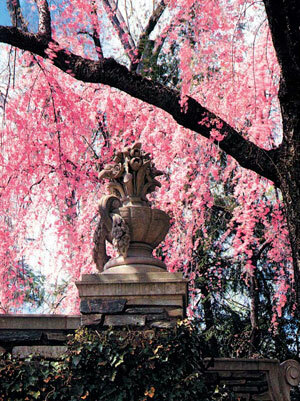 Photograph courtesy of Dumbarton Oaks. The Dumbarton Oaks gardens—formal gardens in the European tradition, but with a distinctively American flavor that acknowledges their setting—are laid out as a series of “garden rooms,” with walls formed by trees in some cases, by terraces in others, with the result that something new lurks around each twist of the winding paths. One has the constant feeling of going where one isn’t supposed to go—a place this beautiful just can’t be open to the public. But it is. 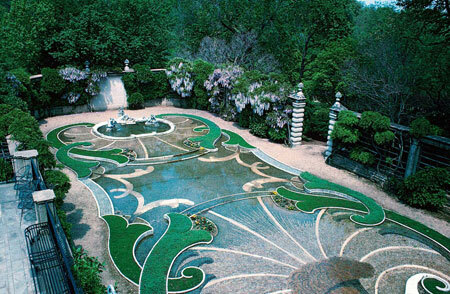 The 10-acre garden opens from 2 p.m. to 5 p.m. in the winter, and 2 to 6 in the summer. Admission during the morning and early afternoon is restricted to the fellows to give them a chance to “rest their eyes, expand their vision, and ponder the subjects they’re working on,” in the words of Joanne Pillsbury, director of the pre-Columbian studies program. These are gardens rich with references. A stone plaque in the wisteria arbor bears an Italian inscription: Quelli chanticamente poetaro leta dell oro/ & suo stat felice forse in parnaso esto loco sognaro, a quotation from Dante’s Purgatorio, translated by Charles Eliot Norton, A.B. 1846, as “Those who in old time sang of the Golden Age, and of its happy state, perchance, upon Parnassus, dreamed of this place.” In the “star garden,” with its zodiac-signs motif, the pavement is inscribed with a passage from Chaucer’s translation of Consolation of Philosophy, by the sixth-century philosopher Boethius (who was executed by a Roman emperor for allegedly conspiring with the Byzantine empire): “O Thou Maker of the Whele that Bereth the Sterres, and tornest the Hevene with a ravisshing sweigh.” The crypt in the rose garden, containing the ashes of donors Robert Woods Bliss and Mildred Barnes Bliss, is marked by a plaque bearing only their names, dates of birth and death, and a Latin version of the biblical maxim Quod severis metes—As you sow, so shall you reap. The Blisses commissioned Beatrix Farrand in 1921 to design the gardens as a setting for humanistic inquiry and reflection. Thus began an intense process that spanned four decades and involved full-size mock-ups of many elements as well as a vigorous back-and-forth recorded in correspondence between Farrand and Mildred Bliss.